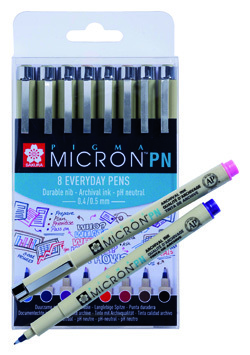 The newest addition to the beloved Pigma Micron line is the Pigma Micron PN (Plastic Nib) which features a nib that is slightly flexible providing the ideal pen for everyday writing, illustrations, planners, and journaling with the same quality Pigma ink performance. Heavy-handed writers will appreciate the added durability of the plastic nib. Available in 8 archival Pigma colours - Black, red, Blue, Purple, Rose, Sepia, Burgundy, Blue/Black.